Leg done, and flap, and turning too! I've picked up the stitches for the gussets--and worked the first round. Visible progress. I only have 4 days left to finish them (if I want to finish them this month—and that is sort of a goal!) But—really, the rounds get easier--so it won't be much of stretch. I'll add some beads on the upper instep—but the last of the beads will come before the gusset is finish—and this is a double statement—I never did get out to the crafts store to buy a second tube—so I only have 20 or 30 beads left. With about 4 per round (8 per pair) I will use up the remain beads very quickly. 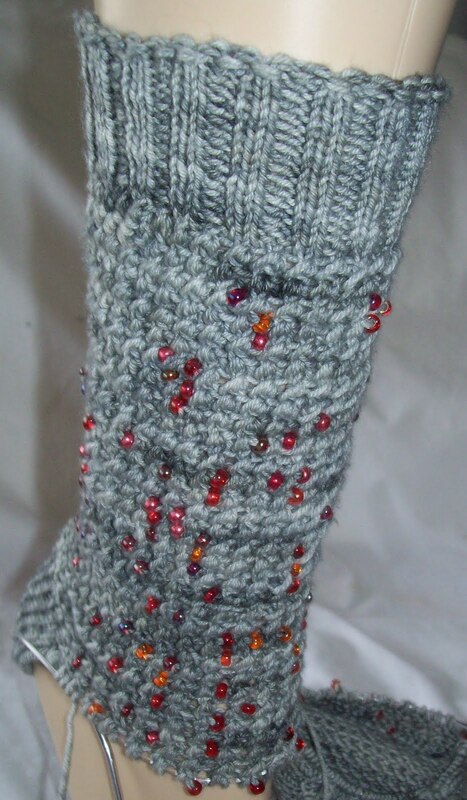 I would have ended the beading anyway--I have some shoes with high insteps, and other with mary jane straps on the instep and I wouldn't want beads in my shoe or under the strap. With the end of the beads, and half the stitches plain stocking knit, knitting will be faster. Adding the beads does slow down the work considerable-It's hard to tell which is worse –prestringing and dealing with the beads on the yarn (round after round) or picking up and threading each bead as you go! Lisa (aka the Tsock Tsarina) who's has not only added beads—but sets (ie, a collection of different beads) to socks—just chimed in on the pro's and con's of merino for sock yarn—and we both agree—it's plenty soft and cushy—and that's its only really great quality. She's off on a new adventure—sock wise—with a new collection of sock designs—and a new sock yarn (not merino) . I know I haven't been happy with the wear characteristics of the Koigu I've knit socks with but then, that was 100% merino—no nylon re-enforcing--this grey yarn does have some nylon in the mix. And for this stitch pattern, the soft cushy texture is a plus--but I agree, it wouldn't be for many stitch patterns. I have so many pairs of sock—in theory—I could—with over 52 pairs of socks wear each pair just 7 or so times in a year--(reality is, some socks get worn more than others) so while I realize the soft, cushy yarn isn't a good choice for sturdy wear--I think they will be OK. These are special socks--(and with the warm weather coming on—sock wearing is optional) and they just won't be worn as often. Besides—I'll have left over yarn—and if push comes to shove, I might just end up darning them if needed!